Thousands of people migrate every day from villages to cities in search of employment. The industrial and infrastructural developments in a city like Pune attract people from various states in the country. Majority of the migrants are unskilled and semi-skilled labourers, who often get employed on construction sites coming up everywhere in and around the city. Usually, the labourer families are provided hutments in the construction premises. The families include children from various age groups, who keep moving from one place to another along with their parents. Most of them do not speak the local language and prefer to avoid unnecessary local interaction. Due to lack of awareness or special attention, the children remain deprived of education during the parents’ struggle for survival. Around 15 years ago, Door Step School identified the need and decided to provide learning opportunities for these children at their own doorstep. 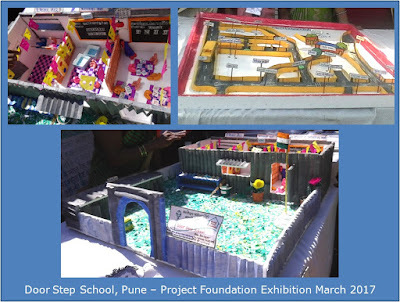 The concept of Educational Activity Centers was thus developed and implemented at various construction sites in Pune. Over the years, there have been lots of experiments and changes in the original model of a construction site class. However, the objective with which it was started and the passion with which it was being run have remained unchanged. The Project Foundation team of Door Step School recently decided to exhibit the journey and methodology of these centers, for the knowledge of various stakeholders involved in the cause. An open-to-all exhibition was organized at the labour camp on Clover Forest County construction site in Kharadi, Pune on 17th and 18th of March 2017. Colourful charts were put up displaying information about the organization and various steps and procedures to start and run an Educational Activity Center on a construction site. Books and teaching aids specially designed by Door Step School for these children were made available for the visitors to view. 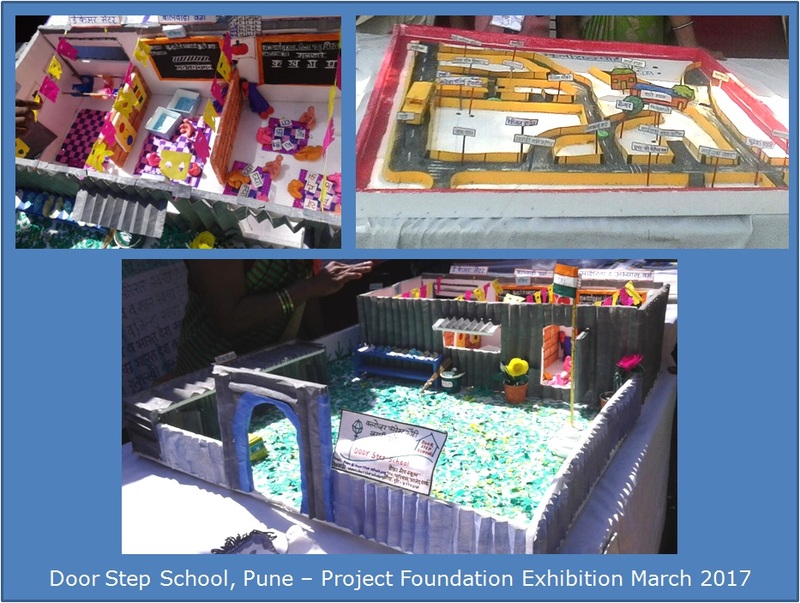 The exhibition counters were manned by DSS teachers and the children actually benefitted by the EACs being run at nearby construction sites. Layout of a typical EAC and its functioning were explained through 3D models prepared by the teachers. Visitors were also taken on a tour to the actual EAC on this construction site – which consists of a Balwadi, a Study Class, and a Literacy Class, in a semi-constructed facility provided by the builder. The teachers and children explained to the visitors, how events are celebrated and science activities are conducted at the centers. Evaluation methods and registers maintained for tracking children’s progress were put on display, along with drawings and craft items prepared by the children. At one stall, children narrated their own journey from dirty and careless appearance to proper health and hygiene habits, while at another stall, children performed science experiments like eruption of a volcano and functioning of a handpump. 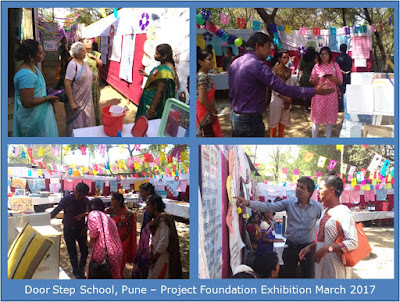 The exhibition was visited by teachers and children from other centers and projects of Door Step School, along with volunteers and representatives of funding partners. It was an opportunity for individuals and organizations interested in starting such educational activities for children from similar background in the city or outside. 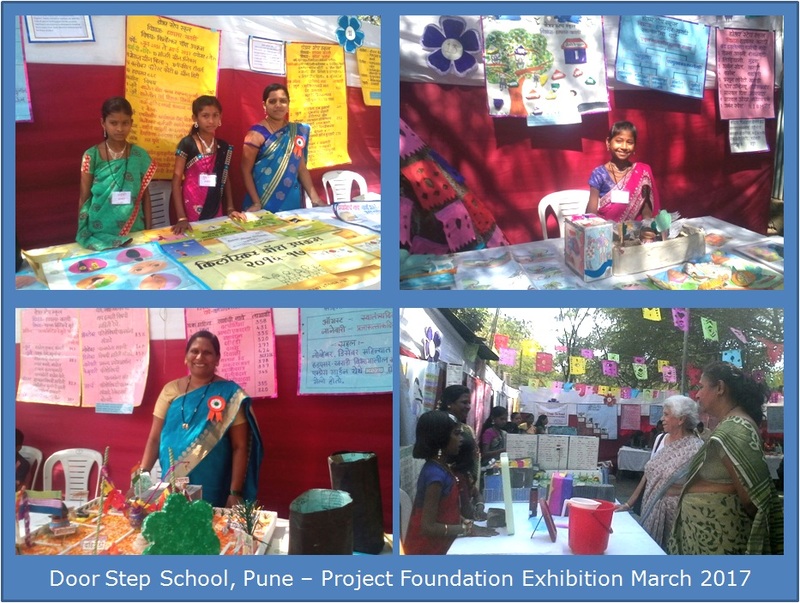 The Door Step School team behind organizing this exhibition was led by Nagesh Alkunte, Dipika Pawar, Tehasin Shaikh, and Meghna Vittubone. The teachers Kalpana Talekar, Neeta Bhalerao, Sajna Tikhole, and Namrta shinde took efforts in preparation, display, and overall management of the event, with enthusiastic and tireless participation from the children.